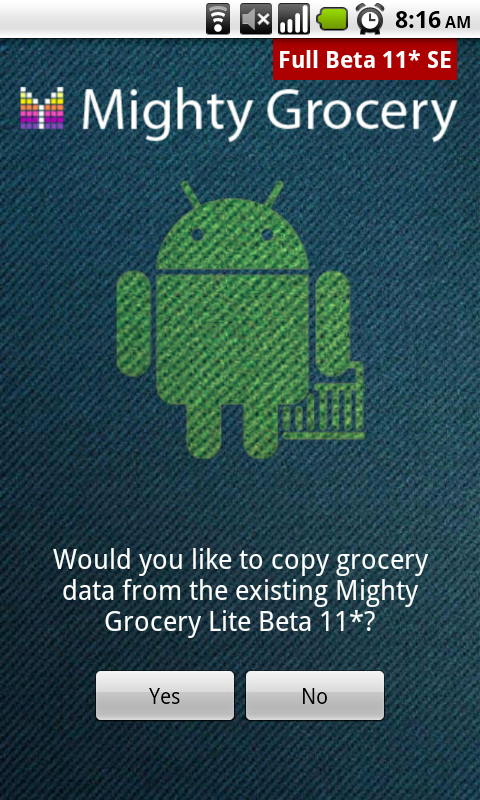 Full version will ask you if you want to transfer grocery data from Lite version on the first launch if Lite and Full versions are compatible (version numbers on top of Home screen match each other). Just tap “Yes” to confirm and wait until transfer is accomplished. If versions are incompatible, application will ask to download latest updates from Android Market so that version numbers of Lite and Full would match. 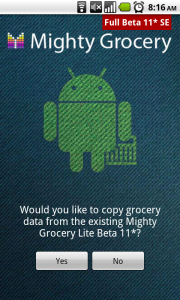 Keep Lite version installed on your device while upgrading to migrate all grocery data to Full version. After successful migration Lite version can be uninstalled from your handset. DO NOT uninstall Lite version before data transfer because the existing data will get lost. Make sure your Lite version has the most recent update from Android Market. Otherwise you will be asked if you want to continue with Full version without copying the data. Uninstall Full and install it again. Android Market won’t ask you to pay again as long as you use the same Google account. Clear app data. To do this, click phone’s Home button –> Menu –> Settings –> Applications –> Manage Applications –> Mighty Grocery Shopping List (Full) –> Clear data. Please double-check it is a full version, not Lite. I purchased the full version, then my phone (handset) got water damage and had to be replaced. I bought the same model handset and had my contacts transferred as well as my same phone number. Do I need to re-purchase the app? I’m using the Lite version in the meantime. Thanks! I’m all set now. Mighty Grocery is the only app I’ve ever paid for, and it has paid for itself many times over with it’s price comparison feature! I recommend it to anyone on a fixed income like myself. Hi, I just bought the full version of Spanish, and leave all the products and tabs in English, Spanish can be put in? Hi Juanma, you can import Spanish products under Menu > Settings > Pick list > Side menu button > Import > Spanish. You may also want to remove English products using Side Menu > Delete presets. As for images, we may consider this improvement going forward. Please let me know if you have any further questions or comments. Hello, I cannot get my Recipe list to sync from my android phone to my Kindle FIre HD. The list does not show up for me to Pull. What do I need to do? Hi Susie, unfortunately it is not possible to sync Recipes in Mighty Grocery yet. However, we have plans to make recipe syncing soon. Thank you for your patience and cooperation. I know how to get a generated password but can you add a feature to set my password after I’ve forgotten and retrieved it? Hi Phillip, thanks for contacting us. Kindly note that you can set your new password in the app under Menu –> Settings –> Accounts –> (your account) –> Owner password. Please let me know if you have any further questions or comments. I have MG on my phone. I now have a kindle fire, can I download MG to my kindle? And if I can do I have to pay again? Yes, you can download the app on your Kindle Fire from Amazon AppStore. You will need to pay again only if you got your Mighty Grocery from a different marketplace. I just purchased the full version of the app. I love it. One thing I noticed, tho, is that when I ported over the data from the lite version the recipes I had entered did not port over. Everything else did, but not the recipe. Is this by design, oversight or bug? Hi Cronniss, thanks for the heads-up. Indeed, a recipe created in the Lite version won’t get transferred to Full version. We allow only one recipe in Lite version for trying it out therefore we did not expect any useful recipe data to be entered in Lite version.